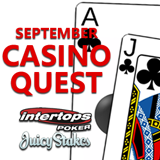 The September Casino Quest rewarding Blackjack and Video Poker players has just begun at Intertops Poker and Juicy Stakes . Hit designated Blackjack and Video Poker hands and you'll get an instant $50 casino bonus! To collect your reward, you need one natural Blackjack and three Clubs Blackjacks as well as five straights and one hand with two pairs in video poker. Wagering requirement: 15X. Details are available under the Casino Promotions tab in the poker rooms. Casino players earn bonus by hitting designated Blackjack and video poker hands. The casinos have several types of Blackjack and dozens of video poker games but to qualify for the Casino Quest only regular Blackjack and Aces and Faces, Deuces Wild, Tens or Better and Double Joker Poker video poker are eligible. The busiest online poker rooms on the Horizon Poker Network, Intertops Poker and Juicy Stakes welcome players from all over the world. In addition to online poker, they also have a wide selection of casino games from Lucktap, Worldmatch and Betsoft.